“How do they not get squishy and turn black and fall off? 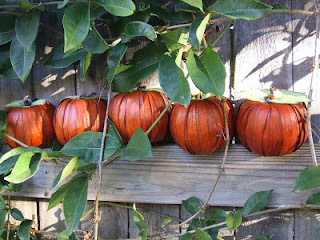 This is what my pumpkins looked like the day after we carved them! I guess they don't like being in the sun! This little exactly 100 word story is linked to Saturday Centus. To read other offerings, just click here. Ick! Is that really what happens to Jack o'lanterns in a hot climate? Poor little pumpkins! I guess the other extreme is in a place where they freeze! you live in melty pumpkin land. The day after? Wow, that was fast! That is so funny! I should never expect less when i visit you. I have never really gotten that sing either, though it isn't the sitting on the fence bit, it was always their reasons for rolling away. They seemed rather contrived. Ha! I keep forgetting that y'all have it even hotter there than where we are. It's at least chilly and feels like fall here. No melty pumpkins for us. Those sad things. Yeah, up here in cooler climates it normally takes a week or so to get to that. Looks like Arizona and jack o'lanterns don't mix very well! Why, why, why? So sweet. Our pumpkin wasn't carved until that day and since trash was on Friday it didn't get a chance to get moldy. Creeps me out! That's why we have fake pumpkins and fake Christmas trees. Nothing real lasts around here. Yep, your pumpkin looks a bit shriveled and HOT!